I’ve been so focused on Christmas this year that I feel entirely unprepared for the new year (anyone else with me here?). That being said, I’m always so excited to put together my yearly ‘Best Pieces Of’ post (you can see 2016 and 2014 also) because I find it such a fun way to highlight my forever goal of building a closet full of wardrobe workhorses, aka the pieces that you don’t just wear once and forget about. Many of 2016’s best pieces are still favorites of mine and I have no doubt the same will ring true for this year’s list. Versatility is pretty key in almost every piece on this list. If I can’t wear something for at least two types of events (meetings, casual weekends, nights out, etc) than it doesn’t really have a place in my closet. Since transitioning out of school into full time adulthood this has become even more important and most pieces on this list are perfect for my casual workplace. I’d love to hear what your pieces of 2017 were as well, so be sure to let me know in the comments! If you read this blog at all, you know that my brown suede booties get a LOT of wear. 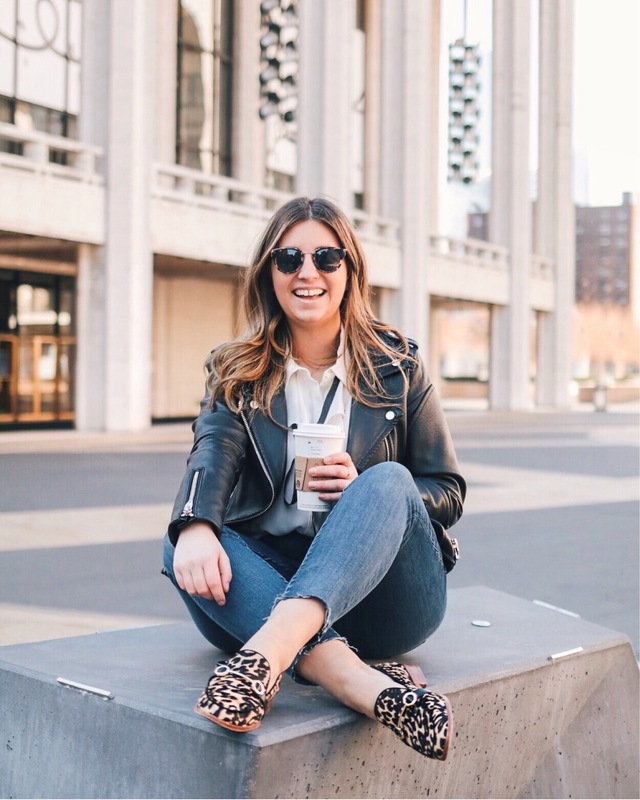 They’re in blog shoots quite often and I probably wore them 2-3 times per week this fall because they work for everything from weekend brunches to meetings at work. If you’re looking for a pair I suggest finding one with a walking but flattering heel because if they’re too high they’ll just live in your closet. I actually won this bag in Damsel in Dior’s annual holiday giveaway and since then it’s become a staple in pretty much every season. 2017 was definitely the year of bringing some color back into my wardrobe and having a cognac brown bag as my go to bag was the perfect entry into doing this. This Clare V version is a bit pricey, but there are so many affordable options under $100 that will do the job just the same for you in 2018. Way back in 2012 when I started my blog denim jackets were in constant rotation, but I’d ditched them a couple years ago when they felt too preppy for my current wardrobe. This summer I found the perfect compromise – an oversized denim jacket feels fresh and classic enough to be both preppy and trendy! A little tip I realized after trying on multiple jackets – try on men’s jackets to get an easy oversized feel with it being too big. I brought home a few wrap dresses this year, from the casual Abercrombie dress shown above to the more resort like midi wrap dress I brought with me to Cuba. These dresses are so versatile and flattering that I found myself reaching for them all summer long. For me, the key was finding wrap dresses that didn’t show too much cleavage. If you have the same issue, my suggestion is just to keep trying on dresses and eventually you’ll find the perfect one! Striped tees are always on my my best pieces lists, so of course this year is no different. This striped tee from Zara that cost under $15 has seriously gone the distance this year. It was my go-to travel tee paired with either jeans or cutoffs for pretty much every weekend trip and I seriously regretted not stocking up on more tees in the same boxy nigh neck shape. I purchased my first (faux) leather jacket my freshman year of college and by the time the beginning of 2017 rolled around it was definitely time for a new one. Since I wear my leather jacket for every occasion (work, fashion week events, nights out, etc) a classic style is essential. I like a classic ‘moto’ shape with a few zippers but not too many! I live my life in denim and as much as I love a trendy pair I always come back to classic skinny jeans and these LOFT skinny jeans have been a wardrobe workhorse. I guess I should be embarrassed to say I wear them at least twice a week but they’re so just good I can’t not! The fit is amazing and the button detailing is too cute! My dad always says I have a wardobe fit for California even though I live in the Northeast and honestly he’s not completely wrong. I’m all about light layers (which I still fully endorse), but for cold winter days everyone needs a seriously warm sweater. My all wool fisherman sweater is just that and even kept me incredibly warm walking around in 15 degree temps. If you’re looking for a warm sweater make sure to check the material to ensure it’s 100% wool. Do you remember this Zara gingham dress that was all over the internet this summer? It was under $50 and I wore is literally every weekend with a light sweater tied around my waist. Then when fall came I threw it on with my denim jacket and suede booties (are you seeing a pattern here? 😂). My new bean boots haven’t gotten a lot of air time on the blog yet since it’s just recently gotten cold and snowy enough to wear them, but damn am I happy I finally bought them! Mother Earth is already showing us what she has in store for the long winter ahead and these boots will save me from cold wet feed when trudging through the famous NYC slush puddles.